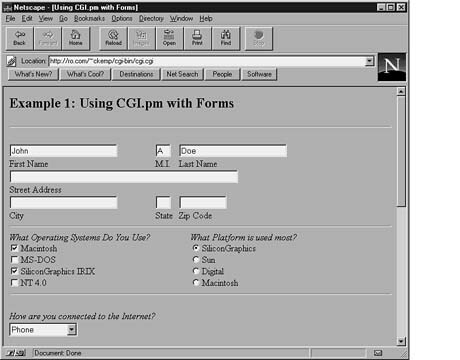 The example in Listing 5.1 introduces the usage of CGI.pm in a typical script that generates and displays an HTML form. When run, the script parses the input from GET and POST methods, then prints the HTML output for a Web page with a form on it. If the script finds any data in the input stream (a previously filled-out form), it will be printed at the bottom of the page. The output is shown in Figure 5.3. The line numbers in Listing 5.1 are for reference only and are not to be typed in. Figure 5.3. The output from Example 1. If your CGI contained this line as the first thing it printed, a well-behaved browser such as Netscape should receive the 204 No Response header and do absolutely nothing. Generating HTML Headers $query->start_html generates all necessary HTML headers to begin a web page, as demonstrated in line 7 of example 1. Adding additional HTML tags to this method is as easy as specifying them. For example, NEWHEADER in the preceding example could be anything. The base tag, if set to true, will resolve relative URLs in the document. In all of the following methods that generate HTML form elements using CGI.pm, the field will be initialized with its previous contents from earlier invocations of the script. When the script is first called, or if the value was not set upon the last invocation, the field will have no value. name The required name for the field. default The default starting value for the field contents (optional). size The size of the field in characters (optional). maxlength The maximum number of characters the field will accept (optional). -rows The height in number of lines of text the field will occupy. -columns  The width in number of fixed-width characters the field will occupy. -name In addition to being the required name for the checkbox, this value will also be used for the user-readable label printed next to the checkbox. -checked Specifies that the checkbox is turned on by default (optional). -value Specifies the value of the checkbox when it is checked. If not provided, the word on is assumed (optional). -label The user-readable label to be attached to the checkbox. If not provided, the checkbox name is used (optional). -values An array reference used for the user-readable labels printed next to the checkboxes as well as for the values passed to your script in the query string. -default Can be either a reference to a list containing the values to be checked by default or can be a single value to be checked. If this argument is missing or undefined, then nothing is selected when the list first appears (optional). -linebreak Can be set to true to place line breaks between the checkboxes so that they appear as a vertical list. Otherwise, they will be strung together on a horizontal line (optional). -labels A pointer to an associative array relating the checkbox values to the user-visible labels that will be printed next to them. If not provided, the values will be used as the default (optional). -default The name of the default menu choice. If not specified, the first item will be the default. The values of the previous choice will be maintained across queries. -default Either a reference to a list containing the values to be selected by default or can be a single value to select. If this argument is missing or undefined, then nothing is selected when the list first appears optional). -size The number of vertical rows to be displayed in the list (optional). -multiple If set to true, allows multiple simultaneous selections; otherwise only one selection will be allowed at a time. Likewise, an array of values could also be stored to a variable.